When most people hear the word "drone," they probably picture a cockpit-free plane zipping over the Iraqi desert. But there's more to it than that. The Army is in the process of adopting a whole new generation of unmanned vehicles that will assist soldiers on the battlefield—and they're by far the scariest remote-controlled cars you'll ever see. Videos are now emerging from a jaw-dropping "Robotics Rodeo" demonstration held for top brass last week in Fort Benning, Georgia. On display were unmanned ground vehicles (UGVs) designed to do everything from disarm improvised explosive devices to carry injured soldiers off the battlefield. Oh, and some of these machines carry machine guns—very big, very scary machine guns. Others can also support grenade launchers and autocannons. Those images of the T-800 (a.k.a. The Terminator) marching across the battlefield running through your head right now? Those could be a reality in just a few years. The technology is out there, and the latest demonstration was just to show officers what's possible. Now, the Army just needs to adopt it. 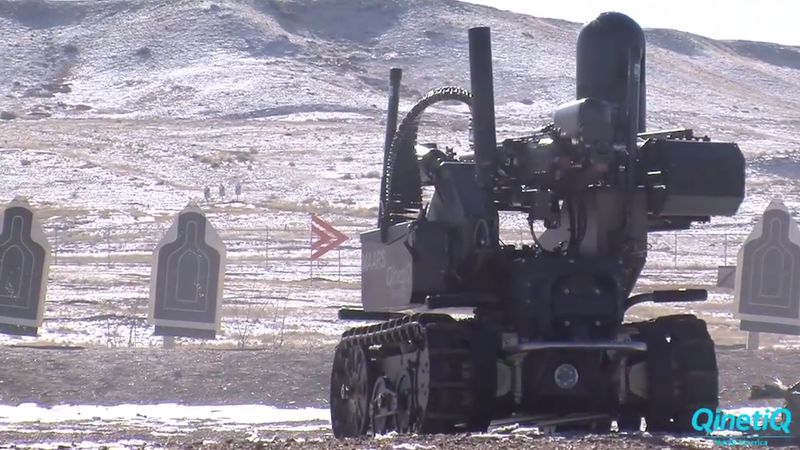 The top four companies that held land robots demonstrations at Fort Benning showcased some pretty terrifying weapons systems. Some of them look like small tanks; others look like characters from the movie Wall-E. All of them are very deadly. Mobile Armed Dismount Support System (MADSS) is a six-wheeled, 1.5-ton ground vehicle designed to provide covering fire for troops on the battlefield with everything from an M240 machine gun to a MK19 40-millimeter grenade launcher. With a top speed of five miles per hour, it's more or less fast enough to follow along beside troops on marches, and is sturdy enough to carry gear as well. The very similar (but unarmed) Carry-all Modular Equipment Landrover (CaMEL) is designed exclusively for carrying gear—more than half a ton of it. Complete with tank tracks, the Protector is arguably more frightening on the approach than its cousin from Northrop Grumman—and it's every bit as lethal. It can also carry an M240 machine gun which can shoot 7.62-millimeter bullets over a mile, all while soldiers control it from up to 3,000 feet away. In addition to carrying gear for troops, it can also clear minefields and dig holes. Made by the same company that gave us the Roomba, the 710 Warrior is a versatile and rugged little guy that can do anything from scale walls to break into cars. The robot is strong enough to pull a truck and sturdy enough to tote 150 pounds of gear. It's also highly configurable, giving developers lots of options for programming it to do new tasks. At the Fort Benning demonstration, for instance, the 710 Warrior learned how to shoot a huge gun. The Modular Advanced Armed Robotic System (MAARS) is a frontline fighter that's outfitted with day and night cameras, a microphone, motion detectors, a hostile fire detection system and even a speaker for sounding alarms. Based on seeing it in battle mode, it seems like the sirens would be coming from the other side of the battlefield, though.